Blessing: Khonsu is principally a god of the moon, and of time. He protects against the fearful things that stalk the night. A powerful healer, he is famed for his wisdom. 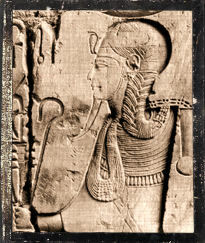 Epithets: Khonsu in Thebes Nefer-hotep, Khonsu pa-khered (Khonsu the Child), Khonsu pa-ir-sekher (Khonsu the provider Chespisichis in Greeks), Khonsu heseb-ahau (Khonsu, decider of the life span), the great god, the giver of life, and the giver of oracles, the expeller of spirits from the possessed, the clerk of the divine cycle. Ways to honor: Pray to him at night, especially during the full-moon; cultivate wisdom and your own healing powers; protect the weak. Just wanted to let you know that the “Egyptian moon gods” link at the bottom is broken, and it looks like the daub may have been bought by someone else.